You'll may need to do this step when you start a new box of ketone or glucose strips. 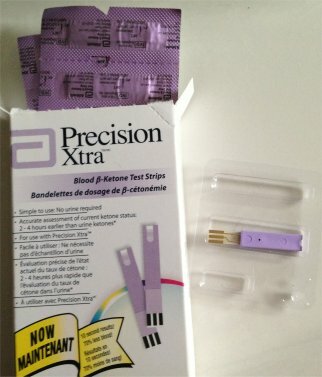 There may be a plastic calibration tool included with the new Ketone strips. Some strips don't come with this feature. Plug the calibration strip into the Ketone meter and wait for it to confirm the calibration numbers. Once that is done, the meter is ready to use. The glucose meter will also have a calibration strip, so if you are starting with a new box, do the same thing with the glucose meter. 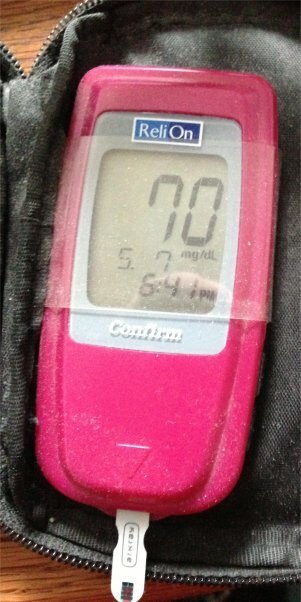 A separate glucose meter is not required, as the Precision Xtra meter can check both glucose and ketones, but I just happened to already have a glucose meter, so I use it. 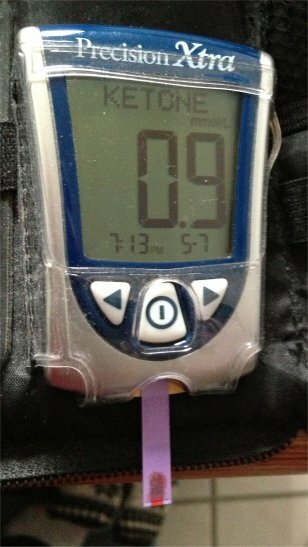 Now that both meters have been calibrated, we are now ready to take a blood glucose and blood ketone reading. For the glucose test especially, your hands must be clean and dry. Using warm water to wash your hands will make the blood flow better. Get the strips ready first, being careful not to touch the testing parts. This will also ensure that the meter doesn't shut off before you can get the strip out and insert it. Open one of the individual ketone strips and take the strip out. You can just place it on top of the meter until you are ready to insert it. Do the same thing with a glucose strip. Once the strips are ready, wash you hands and dry them thoroughly. 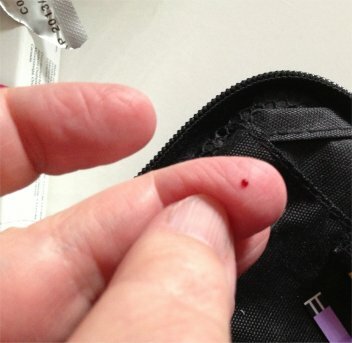 Using the lancet tool which comes with the Ketone meter, prick your finger and squeeze out a small drop of blood. 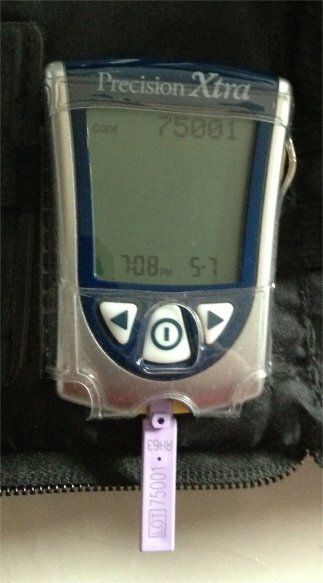 Being careful to protect the blood drop, insert the glucose strip into the meter and wait for the screen to show a raindrop symbol, which indicates that it is ready to test. Then touch the end of the strip to the drop of blood on your finger. 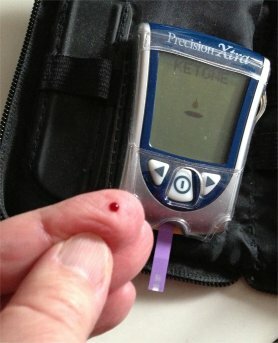 If you using the same meter for both, wait for the blood glucose result, then remove the strip. Now squeeze out a larger drop of blood for the Ketone meter, insert the ketone strip into the meter and wait for the raindrop symbol to show on the screen. Touch the end of the strip to your blood drop and wait for it to draw the blood all the way into the strip. The pictures below show the difference and the raindrop symbol. Wait for the ketone test results. The test results will look similar to the pictures below. Those are my results after fasting for one day. You will do this pretty often so checking blood sugar and ketone levels will become routine. Remember to keep a log of your results along with tracking your food intake so that you can troubleshoot if you don't reach the recommended targets.